Webb Chiles said, "A sailor is an artist whose medium is the wind." Those who have mastered sailing a multi-mast vessel truly are a rare breed. 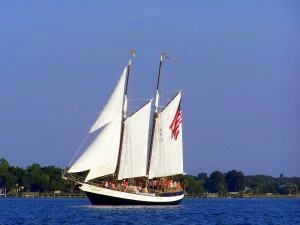 If you are planning a visit to St. Augustine, Florida, be sure to book a cruise on the Schooner Freedom and experience the art of sailing firsthand. You’ll be glad you did. The Schooner Freedom is an authentic replica of a nineteenth century blockade runner. Blockade runners were light-weight ships used for evading a naval blockade of a port in order to transport cargo, food or arms to a blockaded city. The Schooner Freedom is built of steel with aluminum masts and spars. Her sparred length is 76 feet. Her length on deck is 64 feet. Freedom’s beam is a 15 feet 4 inches and her draft is a little less than 6 feet. Her mast is 62 feet high. The Schooner Freedom was the first sailing tour boat to be certified under the Coast Guard subchapter T to carry passengers-to-hire “since the great days of sail.” She is licensed to carry forty-one passengers and required to have a master and two crew members. From the moment we boarded this gorgeous vessel, we were treated like family. The captain and crew members spoke to each and every guest answering questions and sharing life stories. 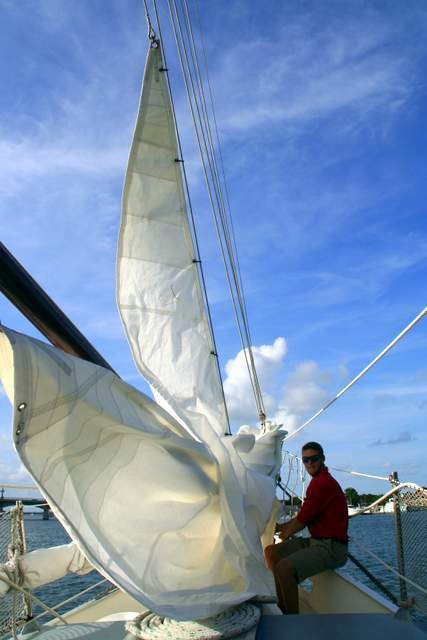 Guests who want to learn how the huge sails operate are allowed to assist in raising and lowering the sails. It is quite an educational experience to watch how the captain and crew constantly adjust the sails and boom to keep the vessel sailing smoothly along. As we sailed past the historic Castillo de San Marco fortress with the cooling wind gently blowing over us, we had wonderful opportunities to view birds such as egrets, herons, spoonbills, gulls, and pelicans. Guests have sometimes spotted bald eagles. We also spotted several dolphins and we were told it is not unusual to see manatees, sea turtles, stingrays and jellyfish. On our sunset sail, the Schooner Freedom offered free water, soda, beer and wine to guests. Sailing on the Schooner Freedom is a very relaxing and educational sightseeing experience. We recommend a Day, Romantic Sunset or Moonlight sail for anyone visiting historic In St. Augustine, Florida. Schooner Freedom Charters is located at the St. Augustine Municipal Marina, 111 Avenida Menendez, Suite D/Slip 86, St. Augustine, FL 32084.